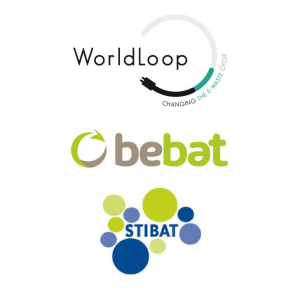 In June, WorldLoop partnered with Stibat and Bebat to facilitate a twofold training on battery sorting at the WEEE Centre Kenya. The workshop, conducted in accordance with the highest international standards was undertaken in two parts combining both theoretical and practical knowledge on battery assortment and storage. Our colleague Marnick Vanlee attended the workshop at WEEE Centre where he and several other WEEE Centre employees were taught the correct procedures on how to classify the various batteries located on site, assort them accordingly and store them in a safe manner, appropriate for its transportation to Europe for recycling. 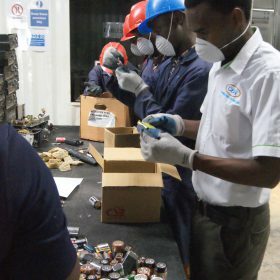 By undertaking thorough training, participants understood the importance of applying best practice for assorting and storing batteries, in order to eliminate risks associated with hazardous materials. The WEEE Centre, a WorldLoop initiative predominately sources e-waste from both public and private sectors then starts the process of dismantling and recycling in a safe environment. By providing the correct technical equipment and skills-based training to dismantle hazardous ICT parts, extraction methods are proved safer for the environment and public health and align with our social responsibility and commitment to renewable e-waste.